Northampton assistant manager Alan Knill says he was pleased with the execution of his side's pressing game in the 1-0 win at Oxford United. Marc Richards' penalty was enough to give the League One leaders victory. "We watched a few (Oxford) games and a lot of teams had dropped off," Knill told BBC Radio Northampton. "We didn't want to do that, we wanted to go and play our game and try to impose ourselves on them and I thought we did that really well." The Cobblers, now eight points clear at the top of League Two after a victory over the third-placed U's, equalled a 56-year club record with their eighth successive win. The hosts managed just one shot on target in the game and Oxford boss Michael Appleton criticised the penalty decision - when John Mullins was penalised for a handball inside the area. 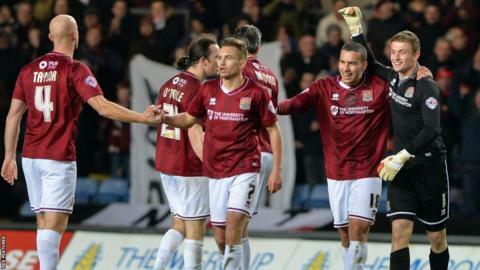 However, Cobblers captain Richards stepped up to score his 18th goal of the season. "There was (a lot of pressure) because it took ages to get the ball back," said Knill. "Marc Richards is renowned for scoring goals and I'm sure he's been in the position many times before. "There's no better player for us to have the opportunity to score and thankfully he took it."